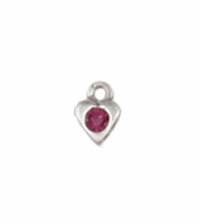 3mm Swarovski crystal in a heart shaped sterling silver setting. It's the perfect addition to your mother's necklace or charm bracelet. Comes with a jump ring. If you want this added to an item you previously purchased, please see the tab below for more instructions.